Most of this is also described in different statutes and laws. I can help you translate the material if you need it. non sono molto pratico dell'uso di discussione su wikipedia ma volevo fornire una informazione per far notare che lo stemma della brigata Goito è errato. La prima spada con manico in argento è dritta e non curva, simbolo della specialità fanteria. Soltanto la seconda, con manico in oro, sovrapposta alla prima, è con lama curva, simbolo dei bersaglieri. Spero che questa informazione sia utile. Hi, can you update the file Structure of the Armée de Terre 2018.png ? Since 1st July, the "école du combat interarmes" merged with the "commandement des centres de préparation de forces" to become the "Commandement de l'entrainement et des écoles du combat interarmes" (COM E2CIA, division level) located in Mourmelon-le-Grand. this is not the "14e régiment parachutiste de commandement et de soutien", the correct name is "14e régiment d'infanterie et de soutien logistique parachutiste" and it's à parachute logistic regiment. the "commandement territorial de niveau zonal" (corps level) included six "areas" : Île de France in Saint-Germain-en-Laye, Nord-Est in Metz, Nord-Ouest in Rennes, Sud-Est in Lyon, Sud-Ouest in Bordeaux and Sud in Marseille. the "commandement de la maintenance des forces" (COM MF) is subordinated both to the "commandement des forces terrestres" and the "Direction centrale de la Structure intégrée du maintien en condition opérationnelle des matériels terrestres". First of all, I'd like to tell you that I'm a huge fan of your Order of Battle graphics. That said, I would like to help you in updating the OrBats of the Brazilian army, helping you with the translation of unit names and the organization of new units. The 18th Border Infantry Brigade (18ª Brigada de Infantaria de Fronteira), subordinated to the Western Military Command (Comando Militar do Oeste), had its deactivation canceled and remains active in 2018. The Orbat of the 18th Brigade can be found here: . Font: . 1st and 21st brigades aren't subordinated to 18th Division yet. There's only 18th Commend Battalion being formed. When ready, then it will take over said brigedes (probably next year). Also, there's second tank battalion in 1st Brigade being formed and 14th Anti-tank Group will be enlarged to regiment size. But by now there are no changes since your 2016 version. I think that for now a 2016 version but with 18th Division and its command battalion is accurate. Could I also ask if you are using any generator for NATO tactical symbols? Hello noclador, I was looking through some of your US Army orbat graphics and noticed that you tend to call units 'staff company' that are correctly designated "Headquarters and Headquarters Company", abbreviated HHC. In the US Army the term 'staff' to designate a unit is not used. For example, in the 6th Infantry Division graphic, all of the units called staff company should be 'Headquarters and Headquarters Company', and 'Staff Battery' should be 'Headquarters and Headquarters Battery'. and the 6th Infantry Division Band (which was directly under the division, suggest putting it below the division HHC). Another relatively minor inaccuracy is that for company designations, the official unit designations are in the order of, for example, 'Company F, 123rd Aviation', not 'F Company, 123rd Aviation'. The US Army, for combat units, also did not use the term 'regiment' in the official designations of battalions between 1959 and 2005, so for example with the '4th Squadron, 9th Cavalry Regiment' you could just write '4th Squadron, 9th Cavalry', avoiding the abbreviations. If you are going to mark the roundout units, like the 205th, suggest doing that also for the 1st Battalion, 188th Air Defense Artillery by adding in parentheses (ND ARNG) below the unit name, as the 1-188 ADA was from the North Dakota Army National Guard. 205th Infantry Brigade (Light) was headquartered at Fort Snelling during this period, so you could add its location for consistency with the regular brigades. Also about the 205th: In the US the Army Reserve is a purely Federal organization, so 'Minnesota Army Reserve' is potentially confusing, suggest just adding (Army Reserve) in parentheses after the unit designation. 6th Infantry Division Band - I do not have a symbol for military bands and usually I only do operational units. Is the band really needed? I did it for the Cavalry unit, but was not sure about the infantry, artillery and aviation units. Please confirm that "Regiment" should be removed from these units too. The band is shown in the army's official TO&E charts with the symbol being a white square with the text 'BAND' in the center, similarly to the MP unit symbol. In the chart, there is no size marker above the symbol. You can also remove 'regiment' from the infantry, artillery, and aviation units. 'Coy' as an abbreviation for company is used in Commonwealth militaries. In the US military 'Co.' tends to be the abbreviation for company. 'Btn' is fairly uncommon in the US context as an abbreviation. 'Bn' is overwhelmingly standard in the US military. The 2nd Battalion, 123rd Aviation was an Army Reserve unit. You can add (Army Reserve) below the unit name. Same as above comment for 3rd Battalion, 14th Field Artillery - also reserve unit. '6th Aviation Brigade' – By 1986 the the aviation brigades were known as combat aviation brigades, change to '6th Combat Aviation Brigade'. Troop E, 4th Cavalry was the Army Reserve roundout unit that served as the ground reconnaissance troop for the 4th Squadron, 9th Cavalry. My source for this is an article in Armor Magazine, March-April 1996, which states that the squadron had a "headquarters and headquarters troop, two 'air cavalry' troops with OH-58 and AH-1 helicopters". It was authorized a ground cavalry troop, but because of budget constraints they had instead the Army Reserve roundout unit, which was likely equipped with Humvees. 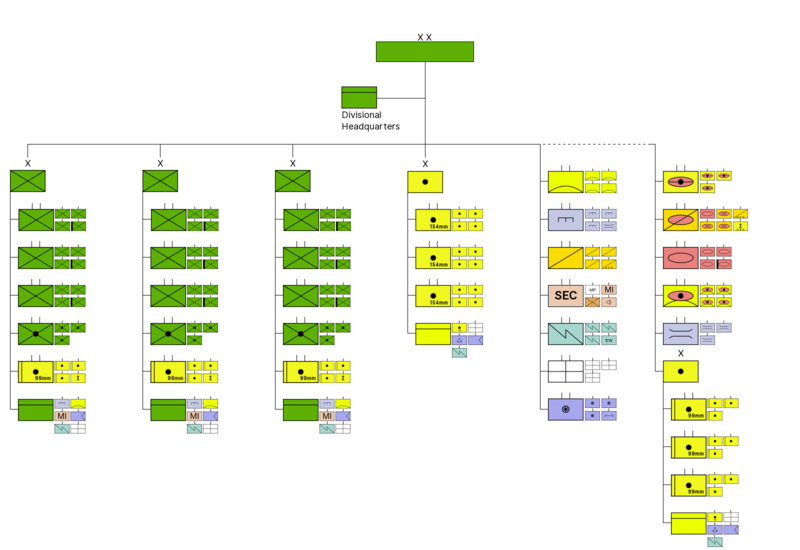 On the other hand, it might be best not to show Troop E, 4th Cavalry, because as I understand it, in event of full mobilization, the troop would have been subordinate to 4-9 Cav and this chart does not show the subordinate units of battalion-strength units. 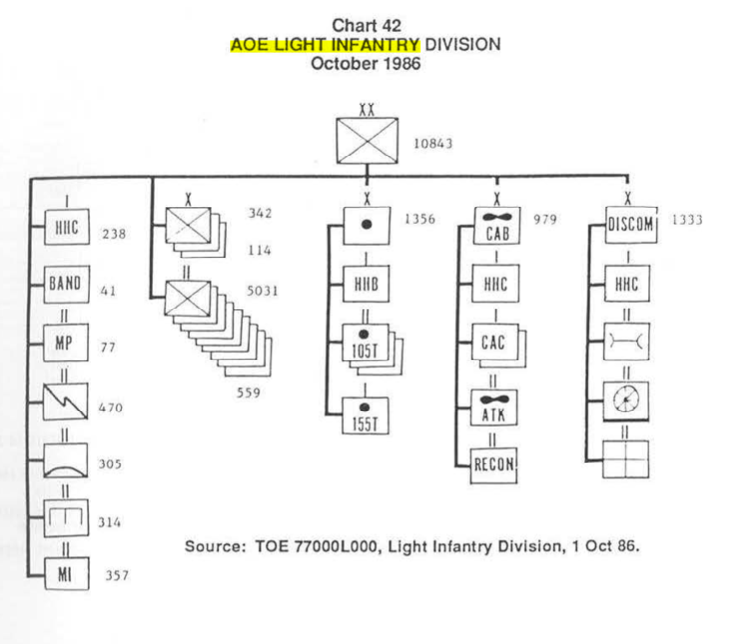 An example of how to show the noncombat units would be this chart from CMH Pub 69-4-1, The army of excellence : the development of the 1980s army. Naturally the current format with individual infantry brigades shown is preferable, but otherwise I think that the way the chart shows the support units looks better if you add the units listed below. '90th Combat Engineer Battalion' is incorrect, should be '6th Engineer Battalion' per contemporary newspaper clippings and army lineage information. The division had the 16th Military Police Company, reactivated in 1988. The 6th MP Company was in Germany at the time. Still a typo under the 2nd Brigade for Fort Wainwright. After looking into the aviation brigade more thoroughly, the official designation was 'Aviation Brigade, 6th Infantry Division', the term Combat Aviation Brigade was not officially used until the modular reorganization of the mid-2000s. Using the informal title could create confusion with the contemporary 6th Cavalry Brigade, the III Corps aviation brigade, which is sometimes incorrectly called the 6th Aviation Brigade. It looks great the way it is organized now. The budget cuts resulted in the 2nd Brigade's third battalion never being activated. One would think that another battalion of the 297th would have been assigned as a roundout like with the 1st Brigade, but I can find no proof of this. The Division Support Command was at Fort Richardson, according to contemporary newspapers. Officially, the 23rd Engineer Battalion was not called 'Combat Engineer'. 'Engineer Combat Battalions' were WWII units, and the combat modifier is not appended on the 3AD association site, showing that 'combat' fell out of use by the 1980s. On 15 December 1989 the 2nd Brigade was inactivated due to budget constraints and the 116th Cavalry Brigade of the Idaho, Oregon, and Nevada ARNG assigned as roundout. 2-120 was an NC ARNG roundout unit. Firstly, I have to commend you on the wonderful work you've done. That said, there are a few things that are not quite right with the Lithuanian Defence Forces orbat. After the 2018 reform, many things were changed that aren't immediately obvious. One of the main things is that there is no Joint Staff anymore (new name is Defence Staff and it lays between Chief of Defence and all units). Military Academy don't belong to this structure amd lays straight under Minister of Defence. The two brigades has also new units as Iron Wolf BRG has new Logistic battalion and Žemaitija BRG (ENG name is Griffon BRG) has infantry battalion named Duke Margiris battalion. There are also some differences outside the main branches. Can I start by saying how much of a fan I am of your work. I wish I had the skills to do it. I was wondering if you are going to make a full US army OrBat like with the UK or Australia (to name a few)? Return to the user page of "Noclador".